So, today I continued the back with mermaids, added the ship now. The usual – freehand drawing and then needles right in. Used only the 15Magnum2. Probably adding some smaller details with 9Magnum2 in the future, but first of all I need to do a lot more shading in there…. PS. I’ve always dreamt about tattooing this kind of ship. Dreams do come true. 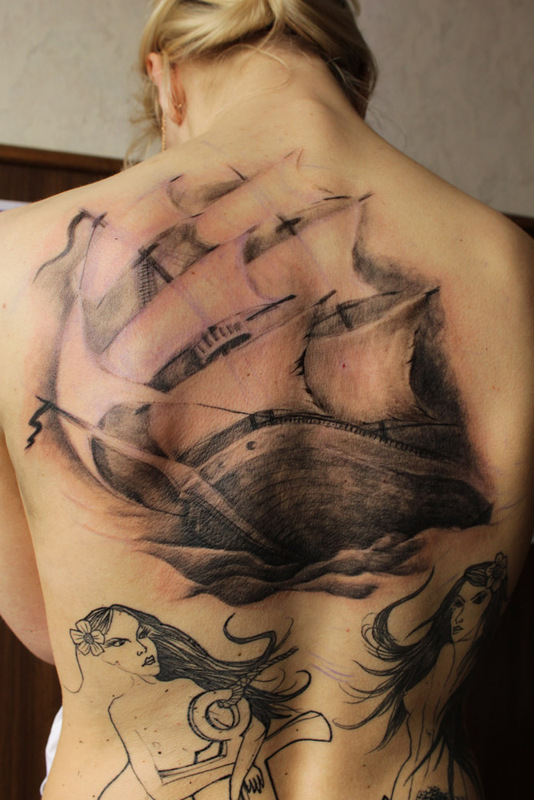 This entry was posted in 2011, back, black'n'gray, cover-up, freehand, work in progress and tagged anchor, ghost ship, girls, mermaid, sea, ship, sinking, storm.